"Southern Kingdom" redirects here. For the principal tribe of this kingdom, see Judah (tribe). For the patriarch of this tribe, see Judah. For other uses, see Judah (disambiguation). The Kingdom of Judah (Hebrew: מלכות יהודה, Malkūth Yehūḏāh; Established::25 Adar 3029 AM-Conquered::9 Tammuz 3418 AM), also called the "Southern Kingdom" after the death of Solomon, was a monarchy, inclusive only of the tribes of Judah and Benjamin, over which the House of David enjoyed an unbroken primacy. This kingdom, like its Northern counterpart, began with the Revolt of the Ten Tribes in either 975 BC (per James Ussher) or 930 BC (per Edwin R. Thiele). It ended with the Fall of Jerusalem in either 588 BC (Ussher) or 586 BC (Thiele). Rehoboam raised a 180,000-strong army to attempt to crush the revolt, but the prophet Shemaiah brought a message from God telling him to desist. Rehoboam was one of many wicked kings, those that "did evil in the sight of the LORD." That he did not even last as long as did his rival Jeroboam I to the north might or might not be significant. Rehoboam had an inauspicious seventeen-year reign, and in the middle of it Pharaoh Shishak raided his kingdom and took much plunder. Thereafter, the glory of Jerusalem under Solomon would never be the same. This was the same Shishak who had given asylum to Jeroboam in the last three years of Solomon's reign. Rehoboam's son Abijam had an even briefer spell. But Asa was the first example of a king who did right in God's sight. In this regard, not every king who "did right" did everything right--but those who did, tended to have prosperous reigns. 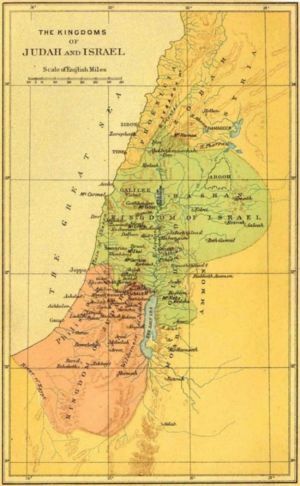 The only matrimonial alliance between the Divided Kingdoms Northern and Southern was that of King Jehoram with the House of Omri in the Kingdom of Israel. Jehoram accepted Athaliah, daughter of Ahab, as his consort. Their son Ahaziah fell in battle against the future King Jehu, who at the time was God's chosen champion in the Kingdom of Israel. When Ahaziah died, Athaliah then tried to kill all the royal family. But Ahaziah's infant son Joash escaped her notice. Six years later, the High Priest in Jerusalem presented Joash to the people and had him crowned. Athaliah tore her royal robes in indignation and accused everyone present of treason, whereupon the High Priest had her arrested, taken outside the city, and summarily executed. Joash grew to be a no-nonsense king. Significant among his accomplishments was the repair of the Temple of Jerusalem, which by then had fallen into disrepair. But then Joash made a major mistake: he paid tribute to King Hazael of Syria and used dedicated Temple objects to do it. Perhaps out of outrage, the palace staff conspired against Joash and killed him. His son Amaziah then took over. The kings of Judah seemed to alternate between right-doing and evil-doing kings. Sadly, the right-doing kings of this period (Joash, Amaziah, Uzziah, and Jotham) appeared not to have their hearts in doing right. Joash fell almost completely away from the faith after his old counselor Jehoiada died. Amaziah is described as doing right, "but not with a perfect heart." Uzziah let his pride overcome him, to the degree that he presumed to burn incense in the Temple, and for that God struck him with leprosy. Jotham was absent from the Temple and was an absentee father—with scandalous results. A careful consideration of the ages-at-ascendancy of these two kings, and the length-of-reign of Ahaz (whose son Hezekiah succeeded him with no interregnum), indicates that Ahaz sired Hezekiah when he, Ahaz, was only eleven years of age. Moreover, the Zachariah referred to in the quote was a Levite and a priest in Jerusalem. The situation must have been a near-scandal to all concerned, and that Ahaz would turn out to be an especially "evil-doing" king should surprise no one. The actual surprise was that Hezekiah would turn out to be not only "right-doing," but especially renowned as a reformer. By far the best chapters in the history of the Southern Kingdom were the reigns of Hezekiah and Josiah. Hezekiah was the first to undertake the most thoroughgoing of religious reforms: unlike many of his predecessors, he destroyed the pagan temples, or "high places," that so many of his people had built, and cut down the wood-carved Asherah poles, or "groves," throughout his kingdom. He also broke up the brass serpent that Moses had earlier fashioned as a reminder to the people of Israel to remember who God was. The people had begun to venerate it as an idol, and Hezekiah recognized that such behavior was inappropriate. Hezekiah also had the Temple repaired and cleaned out, and commanded the observance of the much-neglected Feast of Passover. Hezekiah held the throne during the Fall of Samaria. Later, Sennacherib of Assyria launched an invasion of the Southern Kingdom. Hezekiah famously consulted the great prophet Isaiah for help and prayed earnestly to God. In reply, God struck the armies of Sennacherib with a pestilence, so that Sennacherib raised his siege of Jerusalem and went back home. Unhappily, Hezekiah foolishly boasted of his riches and accomplishments when the King of Babylon came to visit him after that episode. Isaiah later issued the baleful prophecy of the Southern Kingdom's eventual defeat and exile. King Josiah was, if anything, an even greater reformer. He assumed his throne at the age of eight, and by the age of sixteen was already actively studying with the priests in Jerusalem. As soon as he came of age, he gave the same sort of orders as Hezekiah had given, for the systematic destruction of places and objects of pagan worship, and for the repair and cleaning-out of the Temple. In the process, the then-serving High Priest found "the book of the Law," which many believe was a copy of the Book of Deuteronomy or even a full set of the Pentateuch. Josiah had this read to him, and when he realized just how far his people had strayed, he tore his royal robes in deep sorrow. Then, again like Hezekiah, he ordered a restitution of Passover, which again had fallen into neglect. Unhappily, Josiah received a prophecy that the eventual destruction of the Kingdom of Judah was inevitable. God would grant Josiah this boon, however: that he would not live to see it. James Ussher calculated the length of the history of the Southern Kingdom by a straightforward summation of the lengths-of-reign of the various kings of that kingdom. That summation falls only three years shy of the 390 years that the prophet Ezekiel stated was the time of the "iniquity" of Israel. To make up that deficit, Ussher assumed that Jeroboam I fled from Solomon and sought asylum from Pharaoh Shishak three years before Solomon's death and the Revolt that split the Kingdoms. Edwin R. Thiele, however, attempted to synchronize the reigns of Jehu and Ahab to certain questionable mentions in Assyrian chronology, and also assumed that Sennacherib's campaign occurred in 701 BC. To "fit" the chronology of the Divided Kingdoms to the Assyrian "historical record," Thiele moved the reign of Jehu to a date forty-three years more recent than Ussher's date--that is, from 884 BC to 841 BC. The violence that this does to the chronology of the Northern Kingdom is discussed in detail here. The relevant effects on the Southern Kingdom are a telescoping of the reigns of Amaziah, Uzziah, Jotham, and Ahaz (Jehoahaz I). Specifically, according to Larry Pierce's Appendix to the Annals, Thiele assumes that Uzziah began a viceroyship under Amaziah twenty-four years before the Bible says that he did, in order to stay consistent with his revised chronology. Pierce rejects this as flatly impossible. Pierce argues forcefully from this quote that Uzziah assumed office upon his father's death in battle. Pierce furthermore argues that if Uzziah had indeed begun a viceroyship under Amaziah twenty-four years earlier, then he would have had to do it eight years before he was born. Thiele's other assumption violates Occam's razor. To synchronize Sennacherib's campaign at 701 BC, Thiele has to assume that Hezekiah and his son Manasseh somehow had an eleven-year co-regency. This is highly unlikely when one considers that Manasseh was an "evil-doer," while Hezekiah was one of the Southern Kingdom's two great reformers. Worse yet, Scripture specifically says that the Fall of Samaria took place in the sixth year of Hezekiah and the ninth year of Hoshea, and then that the invasion of Judah took place in the fourteenth year of Hezekiah. This makes a 701 BC date impossible to sustain. This page was last modified on 20 July 2010, at 01:26.